We are constantly surrounded by data. It greets us on social media, in boardrooms and team presentations, on snazzy infographics and in sombre economic forecasts. When it comes to contemporary marketing practices, data is increasingly becoming the central currency by which value-adding content is traded. Reputations and companies are built on the ability to create narratives which are backed up by compelling data. But data alone doesn’t quite cut it. The internet age is also one of telescoping attention spans and a desire for compelling content. Visual presentation is the magic ingredient that makes data consumable on a mass scale. Even the most compelling Ted Talk orator will use visual data presentation to bolster their arguments and lend weight to their insights. The contemporary internet user may have a short attention span, but that doesn’t mean that they are looking for frivolous content. Often, they are in search of deep insights, but there’s so much background noise it can be hard for your brand’s insights to get heard. Data visualizations are popular because they can instantly convey complex information and let users drill down into topics quickly instead of wading through dense reports. Proof that data visualization provides instant insights can be found in one study where economists were asked to solve an economic question about data they had been presented with. The majority of economists–72% of those who just saw the data–got the answer wrong. The group who saw the data and a visualization did slightly better. But the remarkable thing is that those who just saw the data visualization overwhelmingly got the answer right. Only 3% got it wrong. Data visualizations can also appeal to our sense of aesthetics. Done right they are an art form in themselves and they make great hooks to the stories journalists tell. Proof of this can be seen in the popular subreddit, Data Is Beautiful, which is full of examples of compelling data visualizations ranging from Game of Thrones characters ranked by screen time to a map of swearing habits across America. When it comes to creating data visualizations you need to think as much like a journalist as like a designer. Ask yourself, what angle am I going to take? An example of a really creatively conceptualised data visualization can be found in the visual-audio feast that is Listen to Wikipedia. Edits made to Wikipedia articles are visualised by on-screen blips which vary in size according to the size of the edit. Additions and subtractions are given pluck or chime sounds, and new user registrations cue a synth stab. The result is an elegant data visualization that feels a bit like a data-based Brian Eno album. Of course, there are less abstract but equally creative ways to visualize newsworthy datasets. On his blog, Jon Schwabish walks his readers through a number of simple ways to reimagine existing data visualizations, to make your data attractive, loud and clear. Another approach to take is to look for a hook that really brings home your arguments. One can easily be sucked into the visualising the internet site, as a case in point. Visitors are treated to real-time updates to all manner of metrics, from the amount of Tweets being sent to how much data is being uploaded every second. AppInstitute created a similar data visualization for app downloads which became something of a viral sensation. We were putting the finishing touches on the construction of a page visualising app downloads and revenue streams when the Pokémon Go gaming app dropped. As the download count rocketed we made a snap decision to capitalise on this and restructure the page to focus on the Pokémon phenomenon. By visualising app downloads since the user started viewing the page we were able to drive home the scale of an app download sensation as it happened. The end result? We attracted over 90,000 site visitors in just one week and generated 450 backlinks, the majority of which were from reputable, SEO-boosting, domains. Once you have settled on the story you want your data visualization to tell, you’ll be needing creative and reliable tools for putting it together. There are a wide range of data visualization tools out there for your use. Whilst some people might prefer to start totally from scratch–tools aren’t without their benefits. 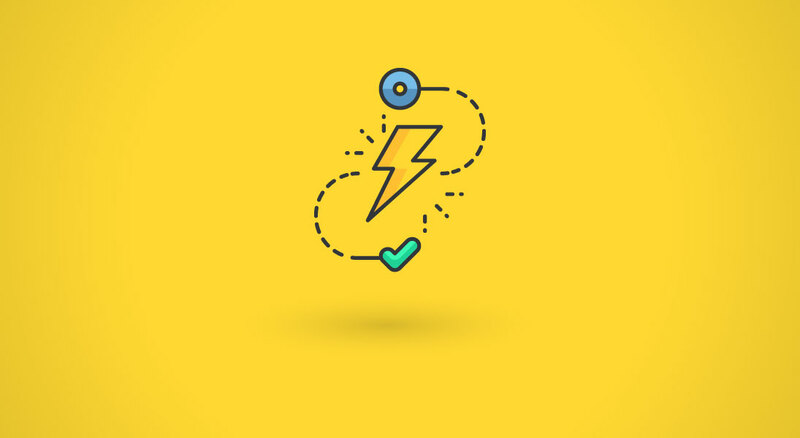 Those with a minimal design background will be able to create something on par with an experienced design guru–and even folks with a little more creative experience in their arsenal might prefer a tool for the time-saving properties it will hold. There are paid-for apps like the popular FusionCharts, which allows users to adapt existing templates to fit their data and features a wide range of chart types and easy integration. There are also dynamic platforms like Venngage that offer free basic plans as well as scalable plans for commercial use. It’s tempting to think that most of your effort should be spent on conceptualizing and creating your data visualization. It wasn’t the data visualization alone that helped us strike gold, however. A ton of manic promotion went on to make sure the visualization got as much exposure as possible. As our Pokémon stats page showed, we put possibly as much elbow grease into promoting it as we did creating it. To achieve this kind of impact, consider putting together a small outreach team to focus specifically on segmenting your subscription base, writing tailored emails, and taking the time to communicate directly with audiences via social media. To promote our visualization, we sent personalized emails to all our subscribers and pinpointed a two-fold audience to target: journalists/bloggers, and Pokémon obsessives. We also hit up our followers on Twitter and Facebook, sending personalized DMs, liking and reposting people’s content before plugging our own and basically leaving no stone unturned when it came to promotion. One great way to find people worth contacting in your outreach is by finding similar content (it doesn’t need to be crazily similar – but something around a similar topic, or style.) and running it through a tool like AHRefs, or Majestic. These allow you to find who linked to that content – and like magic, you’ve got a list of people who would love to hear about your new creation. Knowing your audience is key, not just to the nature of content you create, but also to promoting your visualizations. Our Pokémon Go case study demonstrates that when it comes to promoting your data visualizations you need a deep understanding of your audience. When designing data visualizations, you should also have an eye on the platform you are targeting. 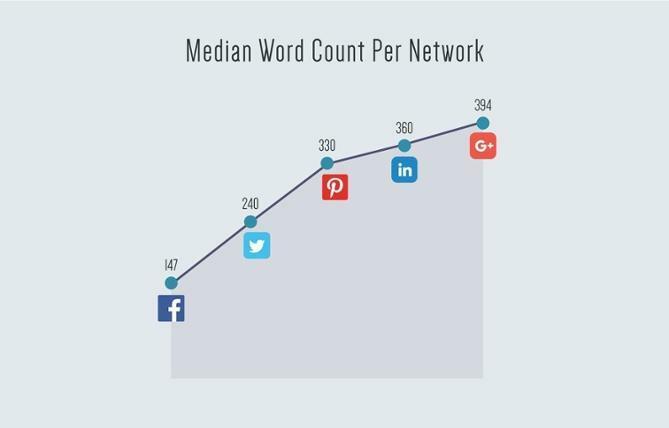 For example, Facebook, LinkedIn and Twitter are good for sharing informational charts, whereas Pinterest and Google + are good for sharing how-to articles or guides. The trick is to first of all work out who your audience is, then work out where they are on the internet. Your analytics will be a treasure trove when it comes to the demographics of your user base – and there’s no end of fantastic content based around who’s using what platform online. Finally, you need to understand the etiquette of connecting with audiences, and make sure that your engagement with them is as two-sided as possible. So, the next time you have a killer infographic to share, make a list of two or three main audiences to target. Then hit them hard. Do as much research as you can into what works and what doesn’t. For example, data visualization is popular partly because it reduces the reading load for viewers. 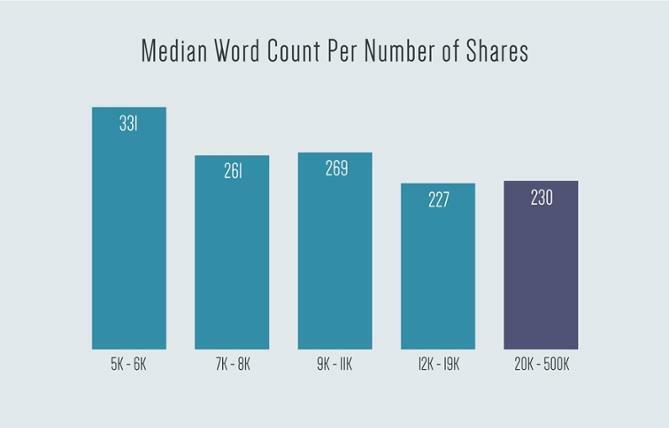 If driving shares is important to you, having a maximum of 230 words is important. 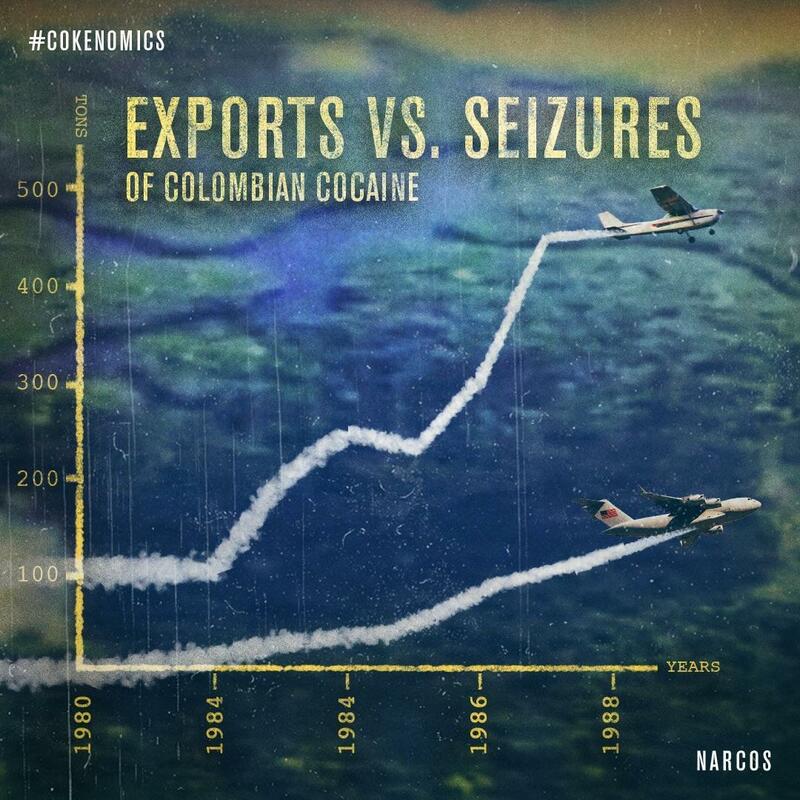 Netflix’s #Cokenomics campaign set out to visualise the jaw dropping statistics behind the Colombian cocaine trade to promote their popular show Narcos. The @NarcosNetflix twitter account was set up to share the beautifully done visuals and the account gained over 200,000 followers. The campaign garnered more than 100,000 likes, shares, and comments and played a big role in making Narcos the top mentioned original series on Netflix in 2015. It’s important to ask, what aspect of your business are you trying to promote? Are you pushing a new product line or trying to create topical content to increase the relevance of your brand? With the Narcos example, Netflix created content that would resonate with fans of the drug running crime drama. They had the insight that the mind-blowing data behind the human stories could hook audiences. What data sources can you tap into to make your products stand out? What’s the context for what you do? 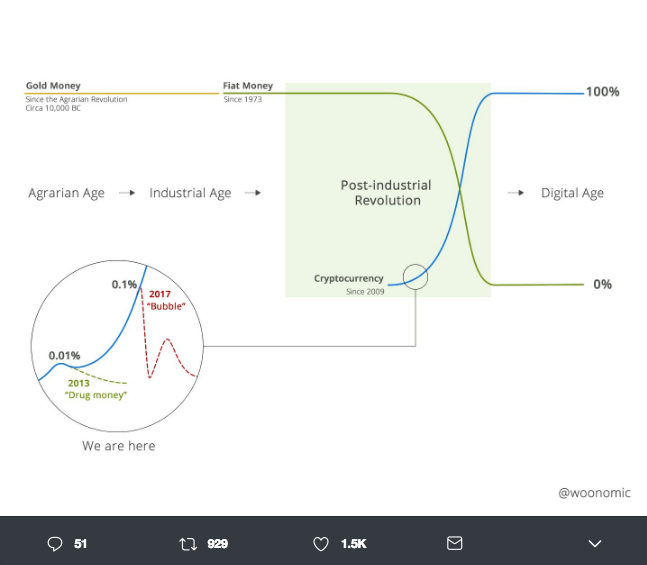 Cryptocurrency analyst Willy Woo designs visualizations that keeps his Twitter feed fairly lively; his data visualization tweets regularly get hundreds of likes and retweets. Data visualization makes us instant mathematicians, rapidly grasping complex topics and giving us almost instant insight and understanding. Note Willy Woo’s strong use of Twitter to get his data out there–this is a particularly good promotional medium because tweets with images get more engagements than plain text tweets. Scottish drinks retailer Irn Bru used data visualization to skilfully position themselves as an underdog success story with their map showing the most popular drinks brand by country. 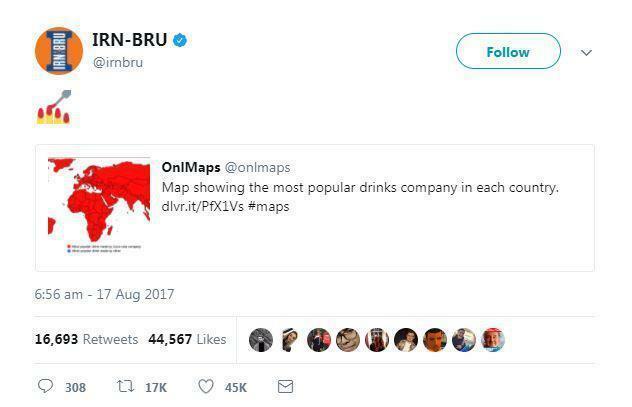 Predictably, the map was painted red to represent Coca Cola, but with one major exception: Scotland, which was blue for the ‘Bru. 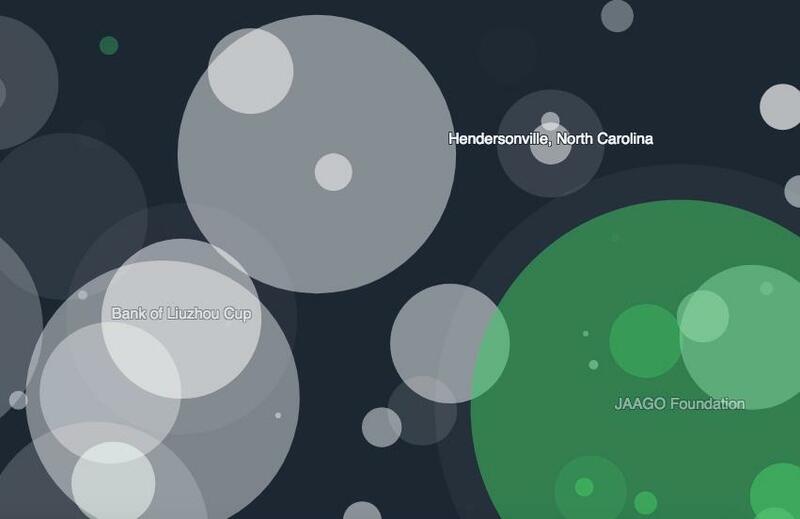 Data visualization is often used in marketing to show a brand’s advantage over its rivals. This was a clever subversion of that idea, a brand extolling the value of its small fiefdom in contrast to that of a giant’s. But its edge lay in the fact that no other drinks brand other than Coke could even claim one country where they are number one. When creating data visualizations, think about how you can use data in surprising and unique ways, like this example. Data visualization is a great way to show the elegance behind numbers. Such visualizations are typically static. 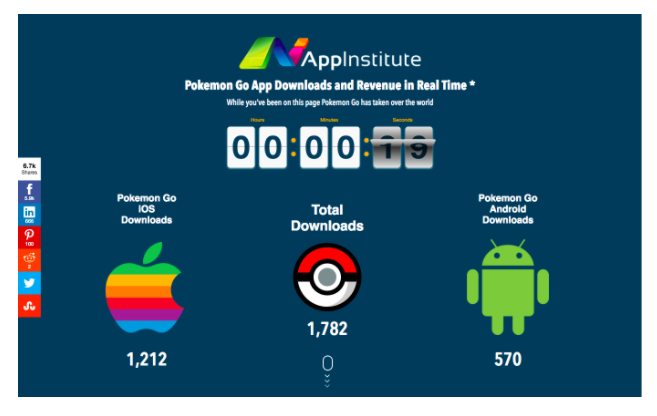 There’s no doubt that that real-time aspect of AppInstitute’s Pokémon Go gave our data a certain frissance. 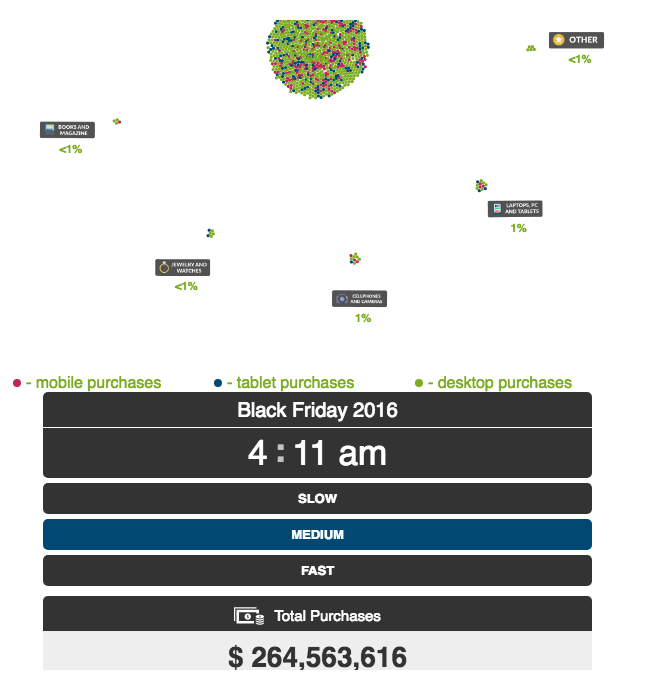 We struck gold again with our real-time visualization of desktop and mobile purchases during the Black Friday period. As a cluster of data points made their way across the screen to represent device purchases over a 24-hour period it brought home instantaneously what would take several paragraphs to explain in copy (like you’re reading now). The complex relationship between all the various devices used to make over $3 billion worth of purchases during the Black Friday online shopping spree. Data visualization has the power to take your content marketing to the next level. The fact that Google prioritises visual content gives us a sense of the way information presentation is heading. And the examples we’ve explored demonstrate the wide range of business types capitalizing on data visualization: from TV production companies to currency traders, from internet analysts to app marketers. You can get started on your way to greater traffic and growth by signing up for a free Venngage account to help you produce stunning visuals, and by exploring the case studies listed in greater depth to find out how they tick. Now that you have a grip on the possibilities for creating effective data visualizations it’s time to put this knowledge into practice by creating and promoting your own content. And remember, a picture is worth a thousand words. Want more data visualization tips?